Zephyrtronics Equipment is Engineered and, Yes, Manufactured in the United States of America. There's nothing like the patented ZT-1 Mega-Grid™ AirBath™ ("the mother of all pre-heaters") with its 32-square inch (220 sq. cm) pre-heating grid and 1,500 watts of power and 50 CFM (1,415 liters/minute) of pre-heating volume and cooling. The forced convection from the AirBath™ preheats PCB's up to 18" x 18" (45cm x 45cm) in size. Unlike inferior IR systems, forced convection bathes the entire PCB with preheat. Forget About IR Systems with their many drawbacks that only preheat the area directly above the IR grid. AirBaths™ have no such limitations! Developed by Zephyrtronics at the specific request of NASA over a decade ago, our ZT-1 Mega-Grid™ is available for your largest PCB's and those with high copper content, heat-sinks, large ground or back planes. What a workhorse this is! The Mega-Grid™ AirBath™ patented protected technology is your effective solution for PCB pre-heating for prototyping or rework at the bench for thru-hole, SMD's and BGA's. Preheat Power: Our Mega-Grid™ AirBath with its powerful 50 CFM (1,415 liters/minute) of air supply and its 6.3" x 5" (16cm x 13cm) enormous heating grid delivers its forced-convection preheat power for those "boards from hell" -- as some engineers say. Beware of imitative pre-heaters with less than 13CFM (360 liters/minute) that crudely attempt to compensate for their lack of preheat air volume with higher temp settings. Remember the glass transition of a FR-4 PCB is only 170°C. You don't want higher preheat temps, you want higher volume of safe preheated (100°C to 170°C) air on your PCB. Loaded With Features: AirBaths™ get into a PCB's nooks and crannies where hot plates and IR preheaters can't go (see expository videos below). AirBaths™ are fabricated from steel, not plastic for industrial use for long production life. AirBaths™ are ESD-safe, RoHS Compliant, exceed U.S. Military Specs, plus uniquely feature indicator lights (blue for cooling; red for preheating). All AirBaths™ have self-contained air supply (no hookups or compressed air requirements). is one of our larger AirBath Preheaters in our extensive AirBath Catalog. We have an AirBath Preheater tailored to your company's PCB needs. The Many Benefits of Preheating Your PCB: The benefits from preheating are multiple and compounding. 1.) Preheating or "soaking" the assembly prior to initiating reflow activates flux, removing oxides and surface films from leads and pads to be soldered, thereby enhancing the wetting process and solder joint quality. 2.) Preheating the board permits lower soldering temperatures. 3.) Preheating reduces the final "dwell time" during the final reflow stage. 4.) Preheating reduces thermal stress to the PC substrate and its components when localized reflow is made with soldering irons, de-soldering tools or hot air systems. 5.) Preheating provides the thermal boost needed when working with RoHS lead-free solders without damaging the work! Critical Thermal Ramping: The Mega-Grid™ AirBath has industry standard, built-in temperature ramping at 2° to 4°C per second preventing thermal shock to sensitive chips, ceramic caps and glass diodes. The ramp is "built in" by design into every Zephyrtronics AirBath™ Preheating System. Digital Illuminated Temp Display & Control: MIL-Spec compliant, the Mega-Grid™ has closed-loop electronic feedback-sensing control and variable temperature selection with a lighted digital temperature display. Microprocessor control permits variable temperature selection with an easy-to-use "set/read" digital display function. This is the greatest pre-heater on earth. For Thru-Hole, SMT & BGA Preheating Tasks: The Mega-Grid™ AirBath is ideal for all PCB challenges from low-volume production runs, prototyping during design, or during rework for all SMD packages such as BGA, CSP, QFP, QFN, TSOP, PLCC, SOIC, SOL, LCC, Flip Chip and Glob Top components. Still, the AirBath is not limited to only SMD devices: Don't overlook the superb benefit the AirBath preheating boost brings to your tough through-hole (PTH) soldering and de-soldering tasks! Plus, it easily handles all substrates including FR-4, polyimide, composites, flex circuits and ceramic boards. 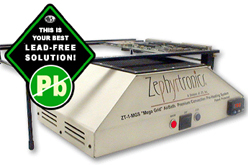 PostCooling™ your PCB at the bench after solder reflow was first introduced to the market by Zephyrtronics nearly 20 years ago. Of course, today anyone knowledgeable with processing BGA's at the bench knows how critical post cooling is to the process so as to form strong solder columns between the pad and the chip so they will not "open" up later. This is very important. Of course, quick cooling has been proven over and again to produce stronger, more resilient solder joints even with hand soldering. It's no wonder that all high-volume PCB conveyor ovens have a final "cool down" feature. Your Lead-Free Solution: Working with lead-free, RoHS solder alloys --- all have higher melting points --- makes preheat essential to PCB work at a bench. Don't raise temps higher on your soldering irons, desoldering tools, hot air tools or thermal tweezers! A brief preheat below the PCB permits soldering/ desoldering at lower temps. The RoHS Lead-Free Solder Mandate: Europe (and Japan) no longer permit the use of traditional tin/lead solders. Learn more about the European Lead-Free Mandate & Preheating. AirBath™ preheaters are your RoHS solution making lead-free soldering a breeze. 100% Non Contact SMT Hot Air Solder Reflow With the AirBath and a Hot AirPencil. Yields Highest Quality Joints. Easier Thru-Hole Desoldering & At Lower Temps With AirBath Preheat. Big Ground Planes? No Problem! Unlike IR "systems", there's another tremendous advantage with Zephyrtonics AirBaths™ -- temp control is "built-in". No small distinction! No fumbling with taping thermocouples on top of PCB's. AirBath™ preheat has temp control by dial or push button with accuracy and repeatability saving time, hassle, scrap and money. 2.) IR: There are many drawbacks with infrared and why it really never completely caught on. Some of the drawbacks (enumerated in articles and white papers) are the difficulty in ramping temps, darker surfaces heating more than lighter ones ('albedo' effect), shadowing caused by high profile devices on PCB's. IR preheaters can warp PCB's and some chips require IR shielding with aluminum foil! If an IR preheater is very large, working on small PCB's can be very uncomfortable for techs (a common complaint). Another real advantage of the AirBath™ is that with by flipping a switch the unit transforms into a post-cooler™ cooling down your PCB, components and your solder joints. Post-Cooling™ is essential to soldering of BGA's because hot air nozzles must not be lifted from above the BGA until all the balled joints have cooled so as not to cause unwanted bridging. It's important to point out the obvious: hot plates, static ovens and IR plates do not provide the critical post-cooling™ feature standard on every Zephyrtronics AirBath™. World First for Preheating PCB's: Judged "Best New Product of the Year" and winner of the prestigious "Vision Award" at the Surface Mount International Expo in Silicon Valley in 1996 for its milestone contribution to the global production of printed circuit boards. 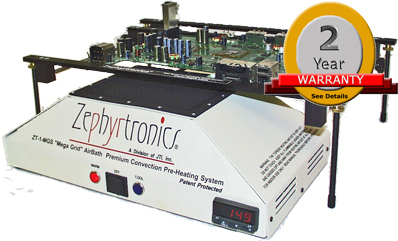 Zephyrtronics AirBath™ was recognized and spotlighted by SMT Magazine in 1997 as a "safer and simpler method for removing and repairing sensitive devices." Zephyrtronics is still the original pioneer and understands the thermodynamics of preheating better than anyone else. Manufactured in Los Angeles: The MegaGrid™ is 100% fabricated and assembled in our state-of-art factory in California. It has a full, two-year limited warranty and is ideal for large PCB's or with high copper content, heat-sinks, large ground or back planes. It's a workhorse! The patent protected technology of the MegaGrid™ AirBath™ is the most effective PCB preheat solution for your needs during prototyping or rework at the bench for thru-hole and surface mount technology including Ball Grid Arrays. The MegaGrid™ AirBath, Our Largest and Most Powerful AirBath™ is Surprisingly Compact in Size and Delivers 50CFM (1,415 Liters/Minute) and 1,500 Watts of Pre-heat Power. want to check out our AirBath Catalog Directory where we have an AirBath Preheater tailored to your company's PCB needs. ©1996 - 2011, 2012, 2013, 2014, 2015, 2016, 2017, 2018, 2019 by Zephyrtronics®. All rights reserved. The information, text, images, photographs, charts, graphs you receive online from Zephyrtronics® are protected by the copyright laws of the United States. The copyright laws prohibit any copying, redistributing, retransmitting, or repurposing of any copyright-protected material. Zephyrtronics is the registered trademark property of JTI, Inc. "The Science of Zephyrtronics" and "Simplicity Through Innovation" and "Zephlux" and "ZeroLead" and "Zero Balling" and "Zero Residue" and "Post Cooling" and "Post Cooler" and "AirBath" and "SolderGlide" and "ZeroTouch" and "SolderMill" and "ZeroTouch" and "Just So Superior" are the protected trademark property of JTI, Inc. "Zephyrtronics" and "Low Melt" and "Air Fountain" and "Fountainhead" are registered trademark properties of JTI Inc. *The above names are the registered property of their respective owners.